This keto chicken parmesan is the perfect easy weeknight dinner recipe. Crusted with pork rinds and topped with cheese, it is truly drool-worthy! Every once in a while, I like to make an easy weeknight dinner that is also very healthy – but still tastes good. 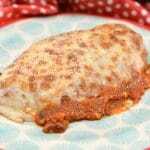 This low carb keto chicken parmesan is the perfect match! No matter if you’re looking for a good healthy meal or are searching for a keto friendly chicken recipe, I’ve got you covered with this tasty dish. Even my picky boys that can never get enough to eat gave this their seal of approval – LOL! You’ll never even know it’s keto, either. It’s mouthwatering delicious and I guarantee you’ll be revisiting this recipe for many more weeknight dinners. Chicken parmesan made the traditional way, is not keto friendly. However, with a few tweaks to the recipe, it is very much so keto-friendly and safe to eat! That’s the great thing about keto – almost anything can be adjusted to the diet. 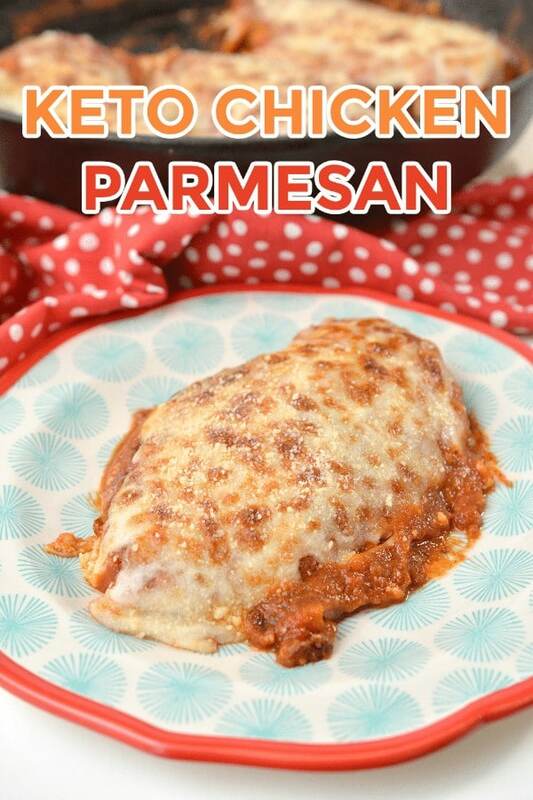 Is chicken parmesan easy to make? It really depends on the style of the recipe since there are so many ways to make it – in the oven, slow cooker, or skillet. 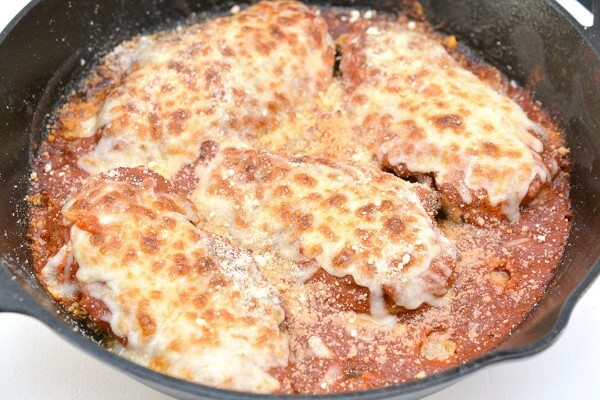 This keto chicken parmesan recipe is made in a skillet and is pretty simple to make. Simply make the “breading” mixture, coat it, and toss in the skillet to cook. Of course, you’ll want to follow the full recipe below to take the guesswork out of it. One of my favorites to pair with chicken parmesan is some sort of pasta such as spaghetti. With this keto recipe, however, you’ll want to find a keto-friendly version such as zucchini noodles. Some other options are salad, steamed veggies, or mashed cauliflower. Before you get started, gather up all the ingredients for your keto chicken parmesan recipe. This makes the cooking process much faster and so much easier! Now to get started, coat both sides of the chicken breasts with basil, salt, and pepper. 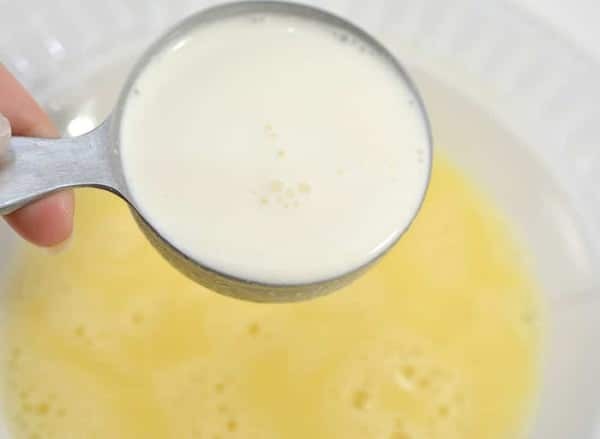 Whisk the egg and heavy whipping cream in a shallow bowl. Pour the pork rind crumbs onto a separate plate and then mix 1/4 cup of the grated parmesan cheese and garlic powder in with the pork rinds. Note: If you need to crush them, add them to a Ziploc bag and roll a rolling pin over the bag. Next, heat up the olive oil in a large skillet over medium-high heat. Dip each chicken breast into the egg mixture and then roll them in the dry mixture to coat both sides. Toss the coated chicken breasts into the skillet and cook evenly on both sides until the internal temperature reaches 165 degrees. Turn off the burner and then heat up the broiler function on your oven. 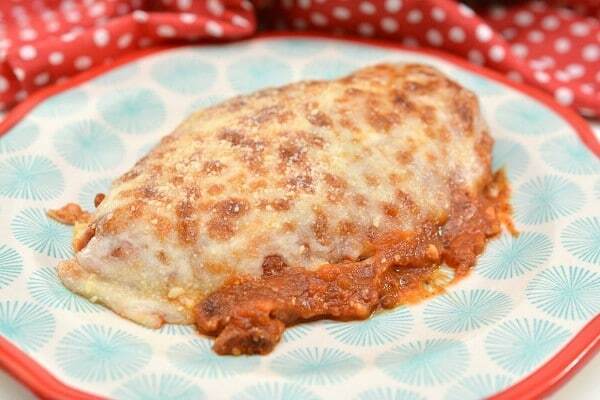 Pour the low carb marinara sauce over the top of the chicken in the skillet and top with mozzarella cheese. Place the skillet into the oven under the broiler until the cheese is browned and bubbly. 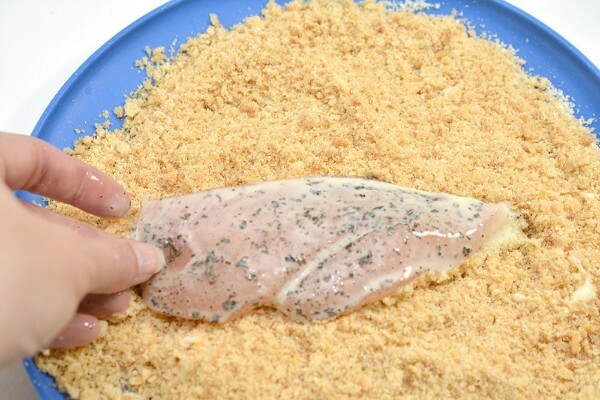 Sprinkle remaining parmesan cheese on top of the chicken and serve hot. Enjoy! If you’re ready to make your own easy and delicious keto chicken parmesan, just follow the recipe below! This keto chicken parmesan the perfect easy weeknight dinner recipe. 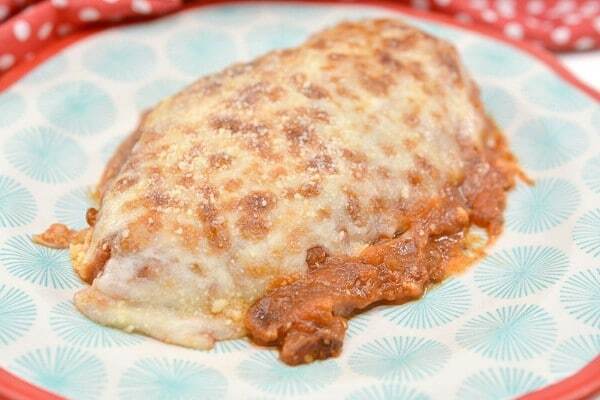 Crusted with pork rinds and topped with cheese, it is truly drool-worthy! 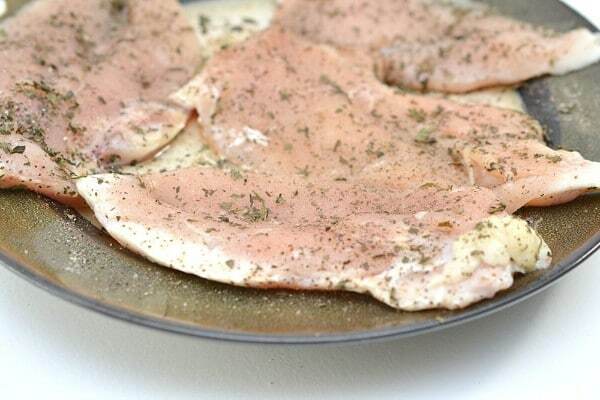 Coat both sides of chicken breasts with basil, salt, and pepper. 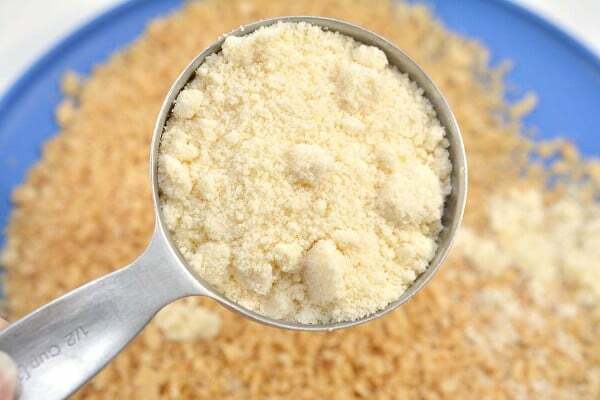 Pour the pork rind crumbs onto a plate and mix in 1/4 cup of grated parmesan cheese and garlic powder. Heat olive oil in a large skillet over medium-high heat. Dip each chicken breast into the egg mixture and roll into dry mixture to coat both sides. 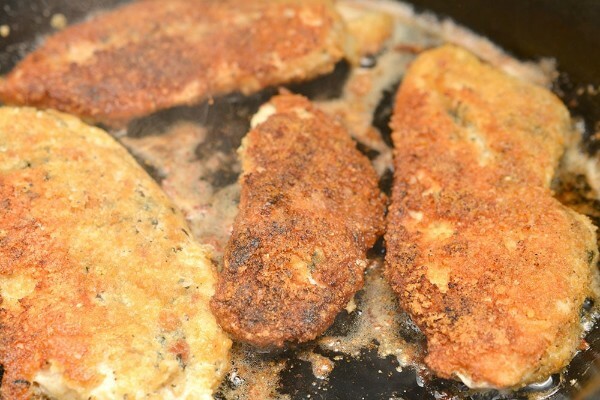 Toss coated chicken breasts into skillet and cook evenly on both sides until internal temperature reaches 165 degrees. Turn off the burner and heat up the broiler. Pour the low carb marinara sauce on top of the chicken and top with mozzarella cheese. Place the skillet into the oven under the broiler until the cheese is browned and bubbly. Sprinkle with remaining parmesan cheese and serve. Enjoy! 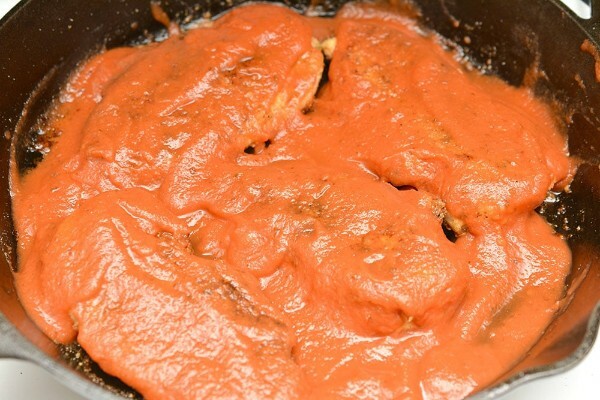 Don’t forget to pin this recipe for later so you can enjoy some keto chicken parmesan tonight for dinner!